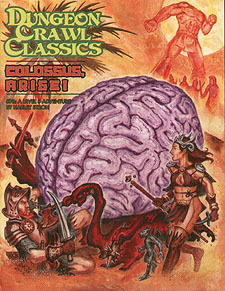 Dungeon Crawl Classics 76: Colossus, Arise! Giants stalk the shifting sands as the lost city of Stylos awakens from its deathless slumber. The Fourth age of Man is at hand! All that stands between the gigantic hordes of Stylos and their conquest of the world is your band of adventurers. Sinister traps implacable foes, and the crushing tread of the dread Colossus all lurk within these pages, eager to test the courage and cunning of even the most accomplished adventurers.